You probably wouldn’t guess by looking at it, but this cozy two-bedroom cottage in Beaufort, South Carolina, was built in 1850 as the first one-room schoolhouse in the area. How fun would it be to decorate a house like this? The cottage has 2 bedrooms and 2 baths, with about 1,300 square feet. It’s hard to imagine this as a schoolhouse. It must have been a small one! Did anyone else stay up way too late watching the Oscars last night? I was excited to see The Great Gatsby win one for Production Design — I really loved the cottage in that movie! Love it. What a charming location. I love walking around historic Beaufort. This is too cute!!!! I love everything… included the coziness! You feel hugged by this cottage. Have a Blessed week, my friend. Haven’t left yet! Today we’ve got another snow day with the kids at home, so a beach still seems like a faraway fantasy. Ha. We lived in South Carolina for four years and would move back except that our grands are nearby here. 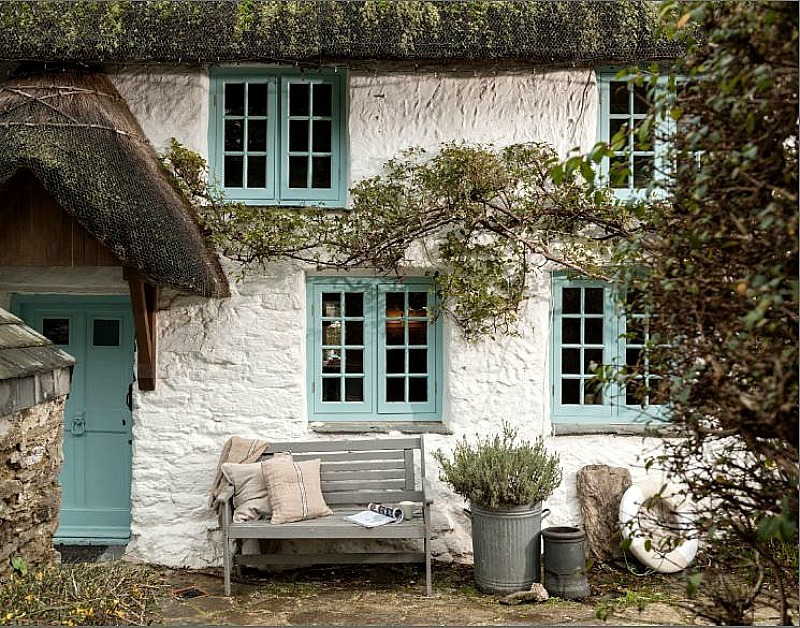 Oh what a sweet cottage…I love it all and as Marcia said, “Wouldn’t change a thing!” Thanks so much for sharing this one Julia. Really charming and I love the decor. Kitchen could use a little tending to, and even though it looks bright outside and there are a ton of windows, doesn’t it still seem a bit dark? Maybe a lot of greenery blocking the sun’s rays? Very charming anyway. Looks like it’s surrounded by really big, old trees, which could explain it. Probably nice on hot days, though! I grew up in a house that was once a one-room school house. It was moved from the corner by the highway down a gravel road to a 5 acre plot of very prickly land. My parents were the 3rd owners, I believe. Unfortunately, there really wasn’t much left of the origninal schoolhouse other than a beam that was covered up. I’m not even sure if that beam still exists? The previous owners had done some poor renovations and my parents continued with some major renovations over the 40 years they lived in the house. It would be unrecognizable as a one-room schoolhouse now – looks much more contemporary. But I love to imagine it as it once was, so many years ago. How fun to have history like that for your home! And how neat that schoolhouse lights are so easy to find and so in style now?! That’s so neat that you grew up in a house with that much history, Kim. I would’ve loved that! Leaving for Beaufort in 19 days for vacation. I will be walking in the Point area in the evenings, I will be sure to check this out! Ooh, lucky you! I love that part of the country. Amazing house! I’m partial to cottages and homes with history. I think as far as structure, the only thing I would change would be in the kitchen, particularly the cabinetry. Still a great house just the way it is. As a side note and completely off the subject….did I miss the post/winner of the kitchen contest? I stop by your blog 2 – 3 times per week, so I am not sure how I missed it (but I wouldn’t be surprised if I did, as my wife’s favorite phrase is “if it was a snake, it would have bit you” whenever I’m looking for something in the pantry that’s right in front of me). I love buildings that have been repurposed; the cottage was so sweet and charming! And yes, I stayed up for the Oscars last night and was so glad that Gatsby won in the design and costume categories. I went out of my way to watch the movie the night before and was blown away by beauty of it. And yes, the cottage caught my eye right away. I laughed out loud at hearing the rent of $80 a month, even though I know it was the 1920s. I live in an area not too far away from the Gold Coast mansions, several of which I’ve visited, including Oheka, and my personal favorite, the Phipps mansion, which is now known as Old Westbury Gardens. Glad I’m not the only one, Mary-Agnes! Yeah, I imagine it would cost a little more than $80 a month now…ha. I’d love to see both Oheka and the mansion at Old Westbury Gardens in person someday. As it turns out, My wife and I just bought this cottage, and the settlement date was yesterday, the same date as your blog entry on it. What a coincidence. We love it and can’t wait to move in. All of the furnishings in your pics belong to the person who owned the cottage until yesterday, so we would welcome suggestions from any and all. That’s cool you just bought it! It’s so sweet and charming and sounds like a charming historic town. Charm, charm, charm. No denying it. This is the kind of place I would love to be in when it rains. I don’t know if I say that because of the tin roof, the setting, or the light in these photos, but that was the first thing that popped in my head. Congratulations to the new owners! Love this cottage. So cozy. 🙂 I heard mean people say Kim Novak should have stayed home she looked so bad. Terrible. The war on women is fought by other women. Hi Julia this is such a pretty home it must be wonderful to live in. Thank you for sharing. We have been watching weather reports on your side of the world it looks so cold and so magical when it’s snowing. I know you have had enough of winter just like we have had enough of summer (pesky flies and mozzies). Till next time Regards Esther from Sydney. Turn on the charm! This would be the perfect house for me hubby and dogs but we would need 2 more bedrooms for our family to visit. This place oozes history and charm and the location is perfect. I adore Beaufort! We could take day trips to Charleston or Savannah! I love your blog. One of my favorite past times is looking at real estate and dreaming of locations to visit. I love that house! If only it was in Southern California, I would buy it in a heart beat!! I live 5 minutes from The Point and walk often there. I know of this home and it is adorable.